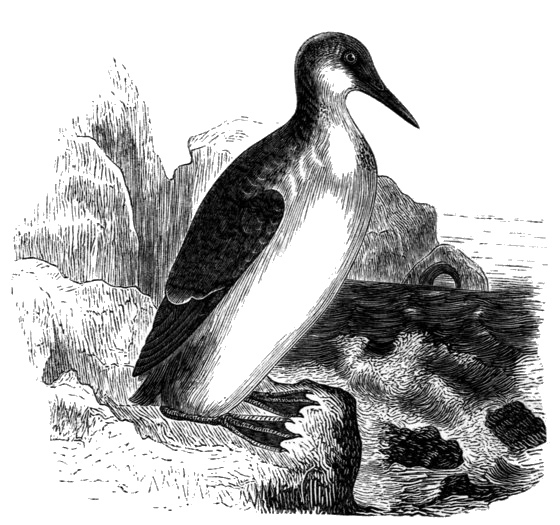 Black and white Guillemot drawing showing the coastal bird in its native habitat. Even though this is a black and white illustration, these birds are generally black and white so we are seeing it depicted fairly closely to how it appears in real life. I’m not sure which particular species is depicted in the illustration. It is from an 1848 work describing one family’s holiday on the Isle of Wight. One of the locals explained to the family how the Guillemot lays one egg at a time on the craggy, rock cliffs. The egg generally takes a month to hatch. If, the egg is somehow destroyed, the female lays another single egg. The narrative goes on to explain that the local population referred to them as “the foolish guillemot” since their eggs are laid on bare rock without the protection of a nest. What I thought was quite interesting about the guillemot was that the author repeated the story that these birds actually carry their young down off of the cliffs to reach the water. Seems like that would be a challenge based on their shape. Guillemots are members of the Auk family of birds.